We discovered Shady Hill almost 10 years ago. Since then we have boarded all of our dogs with them. This is the best kennel we have ever seen. They have a large outdoor area to run and play with other dogs, a covered area in case of inclement weather, and an indoor area for sleeping or getting out of hot or cold weather. They have provided loving care for all of our “family” members, and we rest easy when our dogs are in their care. We cannot say enough good things about Shady Hill Canine Camp. We are so glad we found Shady HILL. When we go on vacation the last thing we want is to worry about our dogs welfare. Shady hill is like a second home to our furry children. They have lots of safe areas to run around a be able to have vigorous play, as well as quiet areas when they need it. 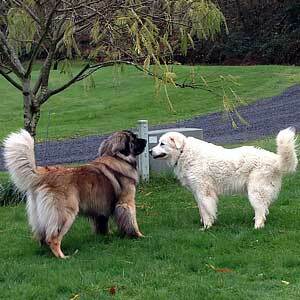 They specialize in large breed dogs and get the personalities of our two great pyrenees. We can enjoy our time away from them knowing they are safe, well cared for and loved. 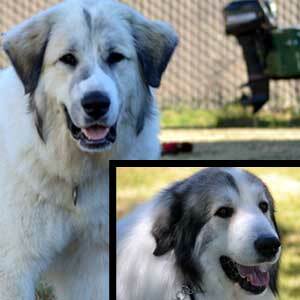 I first met Kathy over 25 years ago, through the local Great Pyrenees Community. I started boarding my dogs there about 10 years ago when my kids were older and we got two more dogs. She does right by the dogs, and they get fresh air, and great care. Kathy really loves all dogs, and this makes it worth it to me to drive 1 1/2 hours from Newberg, OR to Shady Hill so that my dogs get the TLC they deserve. Visiting Shady Hill for ten years! When we leave town and cannot take our best friend with us, we always take her to Shady Hills Canine Camp. We know that she will have a clean, spacious, private den there, with a doggie door that allows her to access a small outdoor run that is hers alone. But what is most important to us is that she likes to go there. She jumps out of the car and heads inside as soon as we arrive. She greets Kathy and her crew like they are family because that is how they treat her. 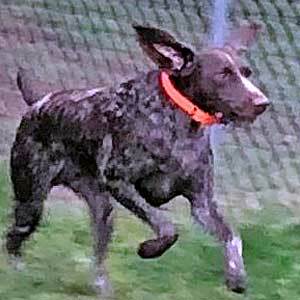 Shady Hills Canine Camp is not just a kennel. It’s a home away from home. To our dog Shady Hills is “dog camp”. When we meet Kathy at drop off our dog will jump out of our car, greet Kathy, and jump into her van. When we researched a place to leave our yellow lab we wanted a place with open runs, no crating and people that love dogs. The kennel is always clean and the dogs are always happy. We have been taking our dog to Shady Hills for over 10 years and could think of no other place for our dog to stay when we are away. True Love at Shady Hill Canine Camp! and Gita completely. Someone is on the property at all times. The boarding kennel inside is warm in the winter and cool in the summer. They have a comfy rubber mat on the floor with blankies to curl up in. They can go outside whenever they want into a covered area with pea gravel, then can be let out into a grass field to run and play with each other or maybe some friends--it is so quiet and beautiful there in the mountains. We have one boy who gets meds twice a day and does exceptionally well with his second family. And they get treats. This kennel and property is the cleanest we have ever seen and they treat our dogs like they were their own--sometimes we find they have actually gained weight during our vacation. We were so happy to find that Kathy and Frank were building a kennel in 2004 that would suit BIG dogs as well as small, and have been customers (and recommended Shady Hill to friends) for many years. 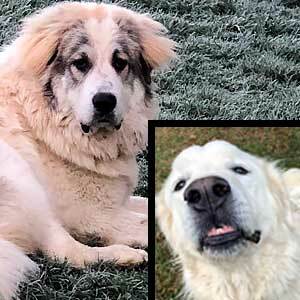 We have 3 Great Pyrenees rescues, and love to meet and greet with the others that are at Shady Hill waiting for a new home.